Using the right lighting for your room is important and tricky sometimes. Not only are lamps and chandeliers expensive, but often it is also hard to find ones that fit your room well. That’s why you may find these creative DIY lampshade ideas handy. If you don’t find the standard lampshade interesting or matching your room well, why not DIY a lampshade to your own style? By this approach, you can always turn your lamp into a piece that you dream of. In addition, there’s something really satisfying by creating a useful piece of furniture with your own two hands, especially if you make it with recycled materials. 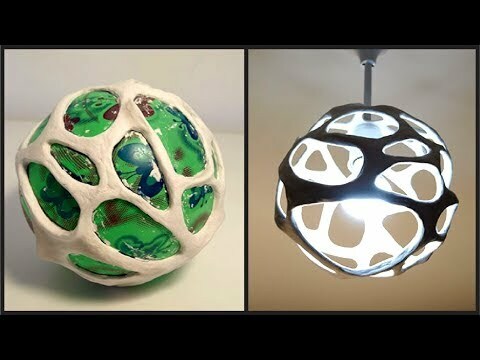 If being crafty and creative while helping the environment appeals to you, here are some really creative DIY lampshade ideas such as desk lamps or chandeliers that will literally brighten your day. There are tons of DIY lampshade projects out there. These are just some of the favorites from our community. Granted, not all of these ideas are truly recycling-oriented, but they can still save you a heck of a lot of money. More importantly, you customized lampshade is unique, special, and cool. If you’re handy in any way, there are probably a project or two here that will get you inspired. Be creative! The possibilities are endless! Which idea is your favorite? Add it here and vote it up!